Time for Lord Windgrace to join in on the fun. Jhoira asks what's going on and Venser tells her that Windgrace is trying to weed out a telepathic spy from everyone in his domain. Windgrace emerges satisfied that both Jodah and Jhoira are free of the telepath's influence. Then they tell Lord Windgrace that the unnatural cold, the appearance of the Phyrexians, and the Weaver King are all symptoms related to the rift above his lands. The news makes the planeswalker pause, as does hearing the new of Teferi's new condition. 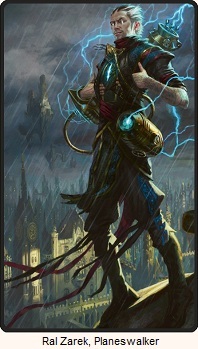 The depowering of a planeswalker is something needs to see for himself. And besides, Lord Windgrace isn't too keen on Jhoira and Jodah. He feels they think much too highly of themselves by talking to him in the way they do. It's he talk to someone who actually is... or was... his equal. Jhoira insists he take all of them with him to meet Teferi so they can all find they answers to their problems together. 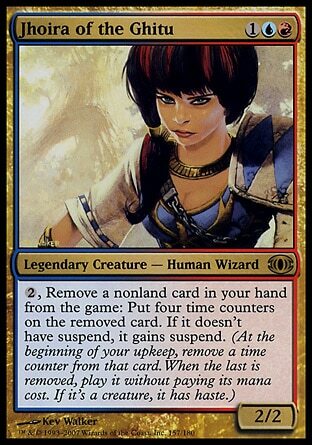 She says that due to Teferi's state of mind she may be the best one to help translate. Windgrace considers the suggestion for a moment, then refuses it outright. He leaves for Shiv with only Venser in tow as per his original plan. What do Jhoira and Jodah do now? Staying in Urborg does them no good. They have to get back to Shiv. Jodah begins preparing a spell that will allow them to travel the magical leylines of Dominaria while Jhoira goes in search of the ambulator as a backup plan. Lord Windgrace and Venser reappear in the same spot that Venser left Shiv from. The room is empty of all the Ghitu, however Teferi remains, still standing in the same spot where Jhoira suggested he watch and learn. 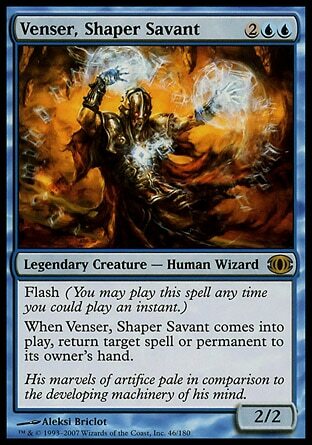 Teferi is still the same as Venser remembered. He gives truthful and direct answers that are detached and devoid of life. With much frustration, Lord Windgrace learns everything that we already know. Something new is that Teferi pulls Venser into the conversation to contribute not just his knowledge, but his own assumptions and guesses. Windgrace informs them these Phyrexians he's fighting now are like none he'd ever seen during the Invasion. They are versions that seem especially adapted to the cold. Venser brings up the idea that they may be coming from alternate realities. 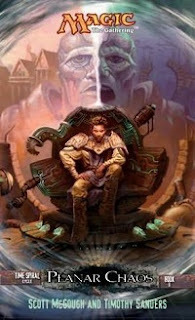 Teferi admits that he, himself is now useless, but suggests to Lord Windgrace that he seek help from Freyalise. Both of their rifts were created through Phyerxian intervention, and together they might best learn how to stop their troubles once and for all. 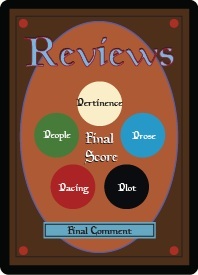 Lord Windgrace struggles with the decision, but concedes. The only caveat is that Teferi is coming with them. "What?" For the first time since they arrived, Venser thought Windgrace had Teferi's full attention. "Say no more," Windgrace said. "I would take it as a grave personal insult if you expected your ploy to work as intended. I am not your dupe." Jhoira and Jodah have made it just in time. He's not particularly pleased, but Windgrace makes up his mind to take them all with him to the meeting with Freyalise despite learning that Freyalise hates Teferi and Jodah and Jhoira, and at best is indifferent towards Venser. Windgrace takes them to the void of space and calls out to Freyalise. Freyalise responds. Windgrace at least seems to have a more pragmatic attitude than Freyalise, and he's probably right to be distrustful of Teferi. Is he right? 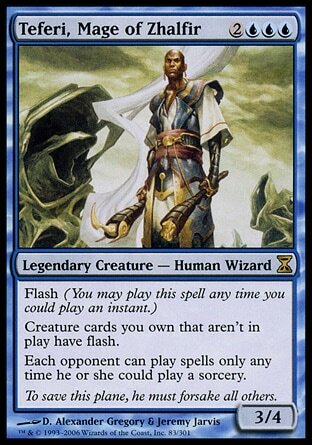 Is Teferi at least even partially acting and not as oblivious of everything that's going on around him? He seems to successfully gotten what he wanted in dragging Windgrace into paying more attention to the Urborg rift, and no doubt Freyalise will soon be drawn into the plan as well. (And likely Karn coming to take on Zhalfir). He also seemed to purposefully bring in Venser and try to help lift Windgrace's opinions of the young artificer. The solution can't be quite so easy however. There is still plenty more book to be read. (Not to mention a whole Book Three to deal with.) Things need to go wrong before they can get better.